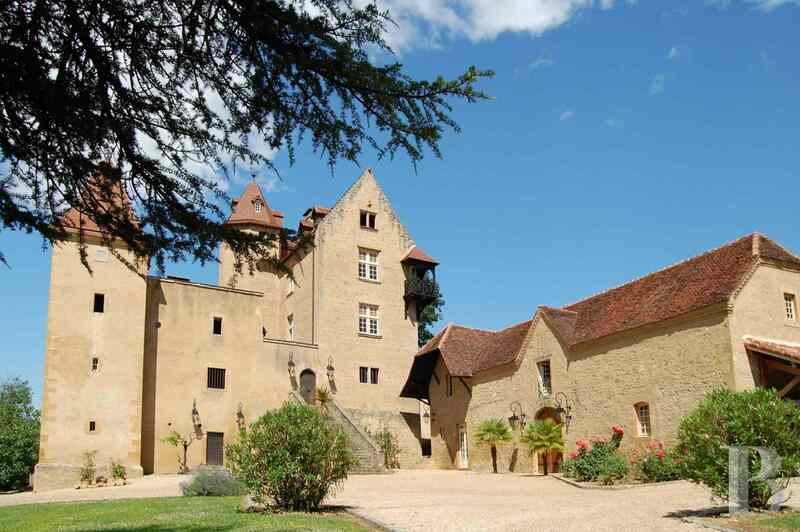 A listed, perfectly restored, 14th & 16th century chateau in 14 ha of meadows and woods in the Béarn region - chateaux for sale France - in South-West, Perigord, Dordogne, Quercy, Limousin - Patrice Besse Castles and Mansions of France is a Paris based real-estate agency specialised in the sale of Castles / chateaux. 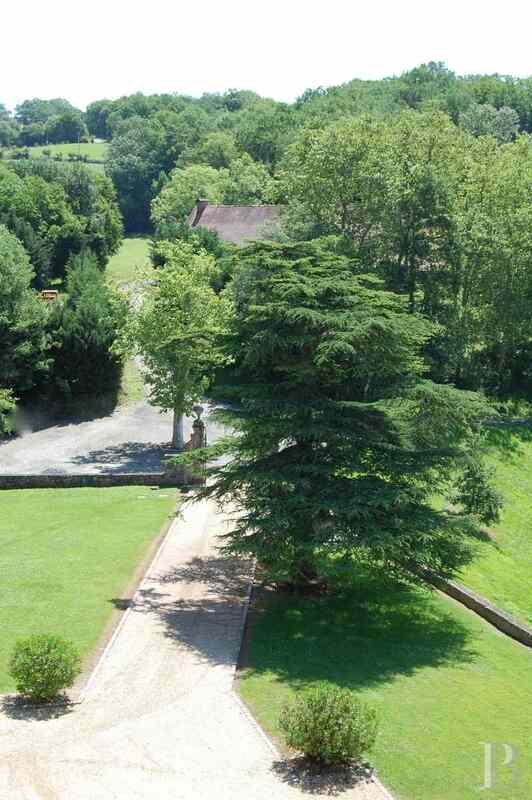 This property is in a region far from any polluting industries, just 45 minutes away from TGV train and international airport links in Pau and Tarbes and barely two hours from Bordeaux, with its TGV train station and international airport. It lies at the southern end of the Madiran area, on a hillside surrounded by woodland with an uninterrupted view of a little vineyard and hills to the west. The chateau stands, isolated, on an old feudal motte. The building is listed and the lawned grounds are a conservation area for orchids. 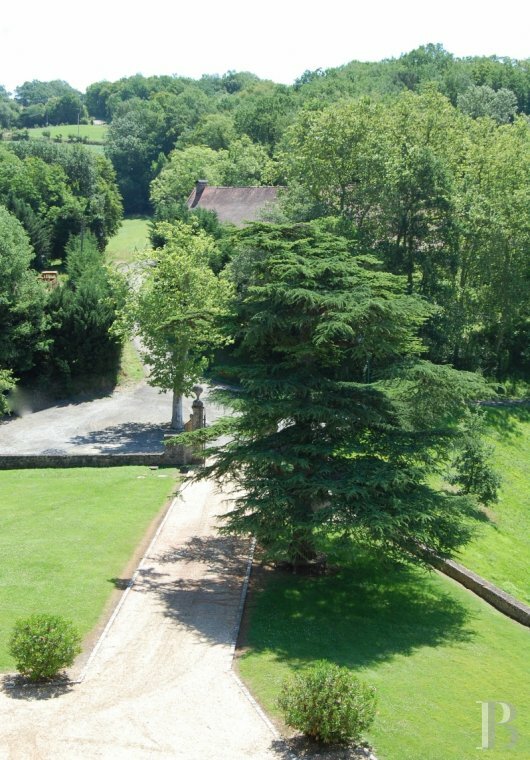 Schools are 7km away with a sixth-form college in Pau. Half-way between the Pyrenean mountains (ski resorts) and the Atlantic ocean, the area is known for its mild climate and its pleasant way of life is legendary. 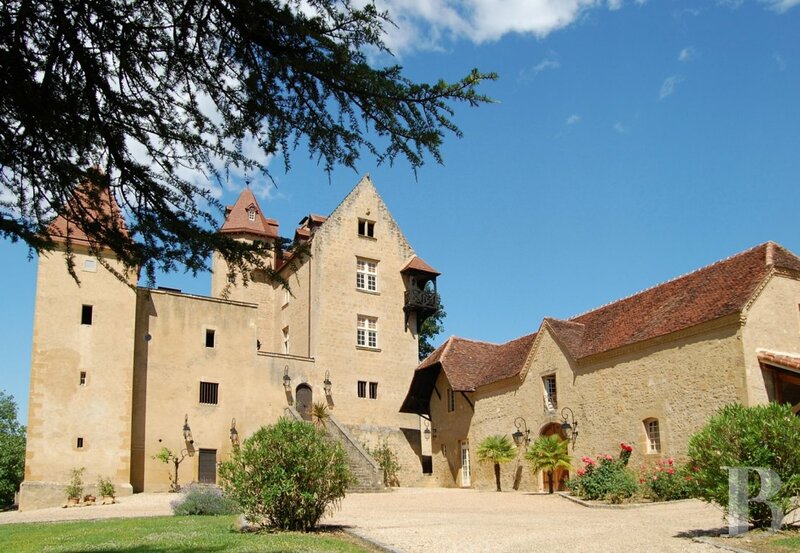 The chateau and its grounds, now spanning a surface area of almost fourteen hectares, once formed a large stately estate, belonging to famous Gascony families from the 14th to the 19th century. 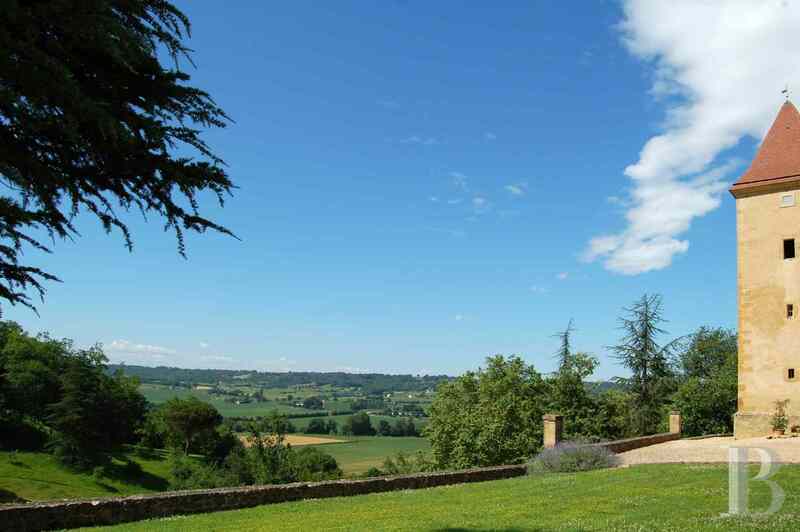 This property is within the Madiran appellation and is therefore entitled to the rights attached to said appellation. 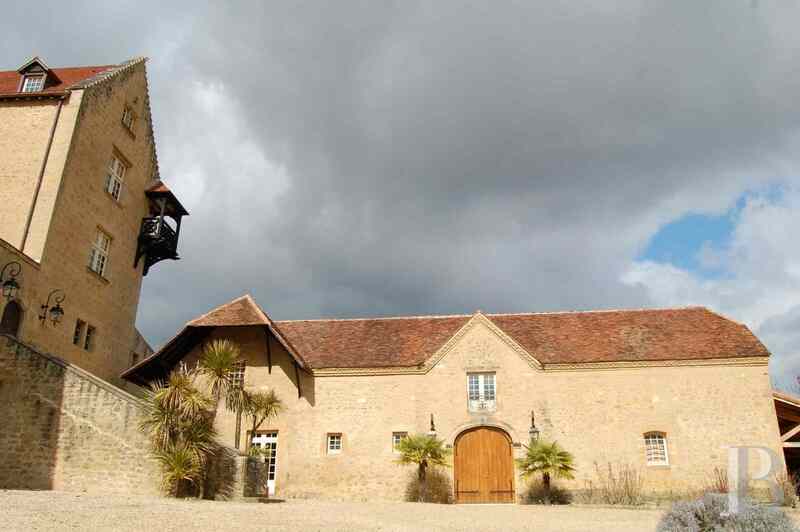 The entrance to the chateau is to the east, on a large plateau just below the crest of the hill. The residence is not affected by the slope of the hillside which offers splendid views, steeped in a soft, generous eastern light. 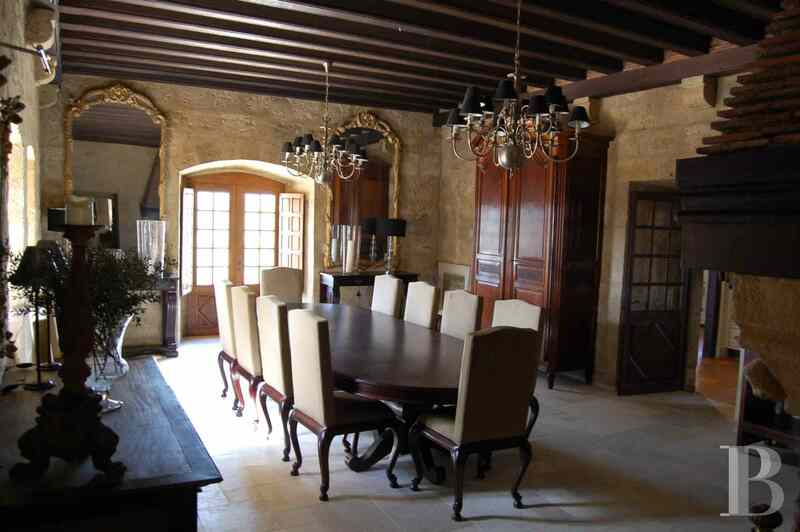 In addition to the residence, the former stables, now converted, span a large surface area, the aesthetics of their construction adding to the beauty of the property. This building could easily become a stables once again. 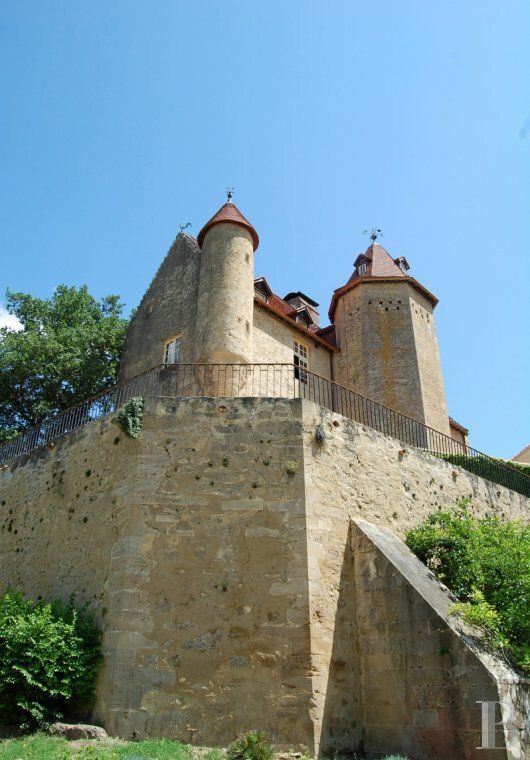 Three horse loose boxes are housed below the chateau, to the east, between the woods and the fields. 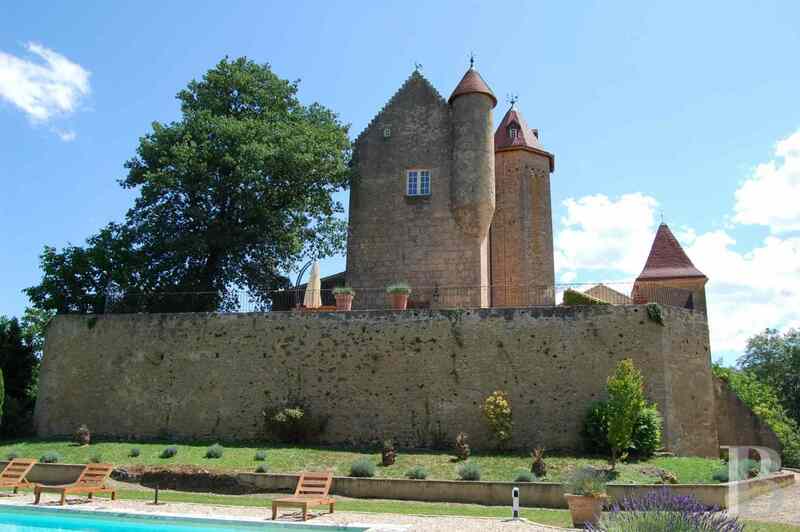 A swimming pool has been installed between the west facade of the chateau, a 16th-century listed dovecote and a copse, stretching down towards the valley. The soberness of the pool means that it blends in well with its surroundings. Access is via a tarmac lane that descends from the village. It leads to a large gate with two stone pillars. The gate opens onto a short driveway with lawns on either side. 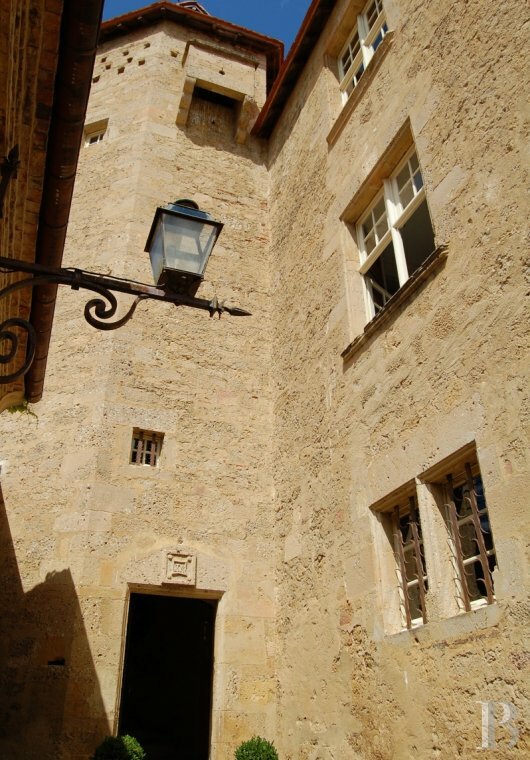 The driveway leads to an open courtyard supported up by a buttressed wall. A majestic cedar welcomes visitors. The building comprises three storeys with a converted loft. 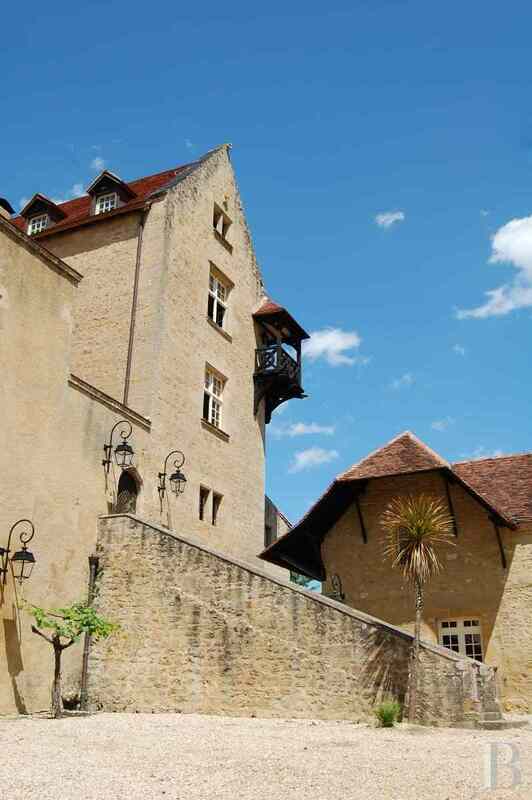 Its 14th-century stone construction has been spectacularly well restored. It has a warm golden sheen and the stones perfectly smooth. 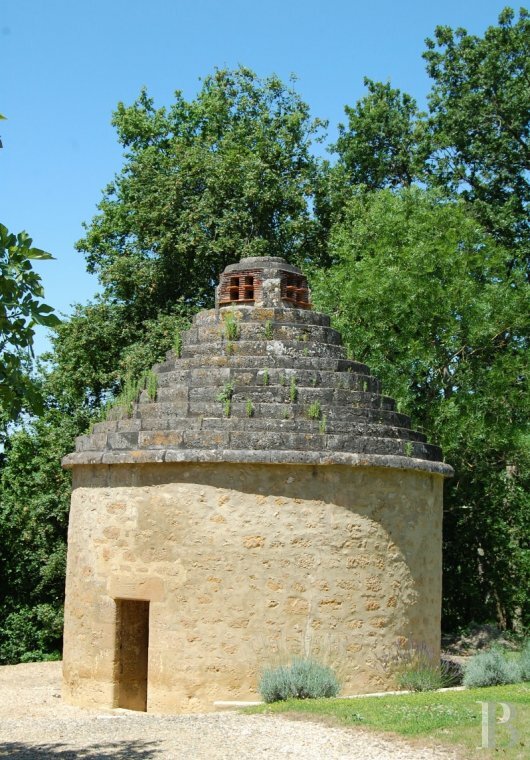 Although not huge, the building comprises a wide variety of architectural features including a square tower, a hexagonal tower and a pepperpot bartizan which resembles a sort of corner tower. 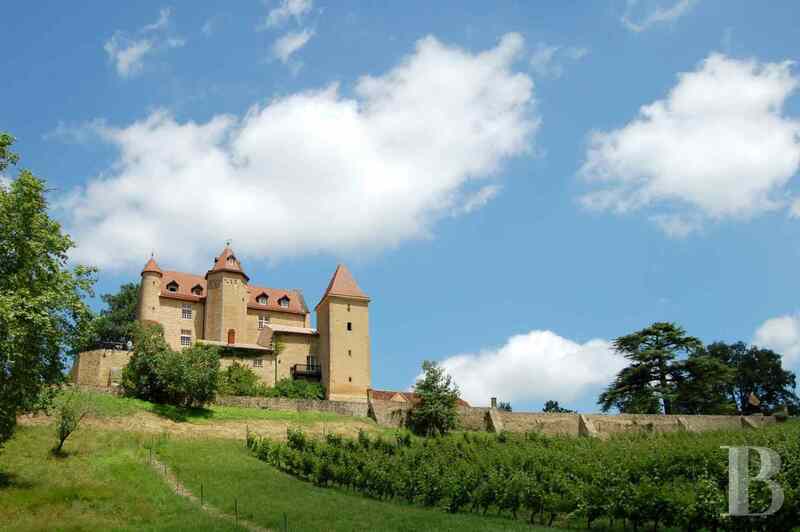 The terrace to the west forms a belvedere. 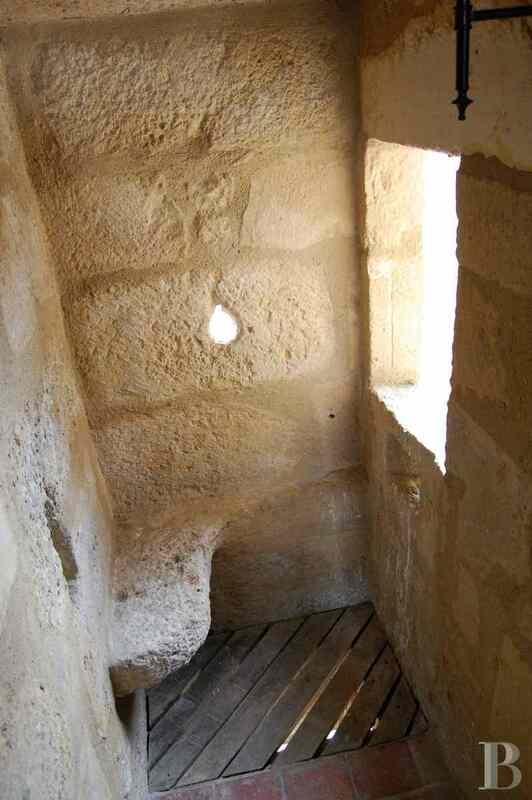 The smaller terrace to the south is more of a passageway. The layout is pleasing to the eye and makes for easy circulation within and around the building. A covered wooden balcony at loft level features on the north-east corner. The original rafters were so well-built that only minor restoration work was necessary. The roof is completely new, with a subtle mixture of flat and canal tiles. The main roof has flat tiles while add-on features such as porches have canal tiles. The copper gutters were fitted in 2010. 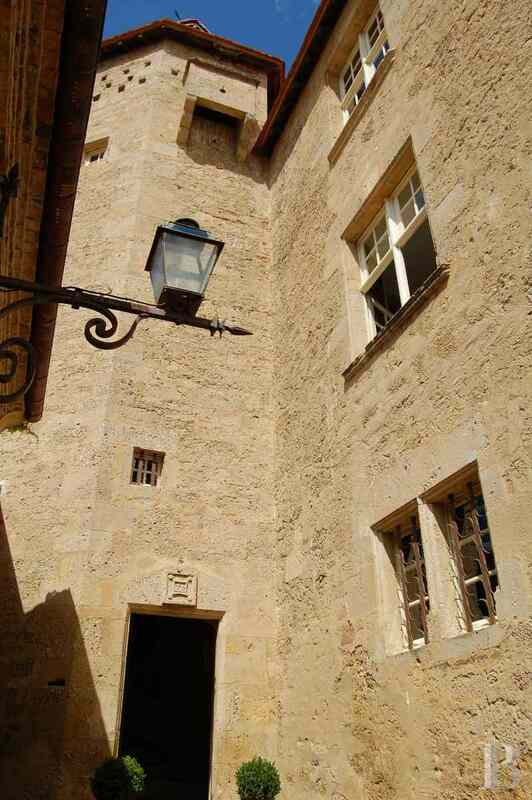 The main building is divided into two parts, separated by a passageway, the entrance to which is through a door at the top of a flight of stairs. 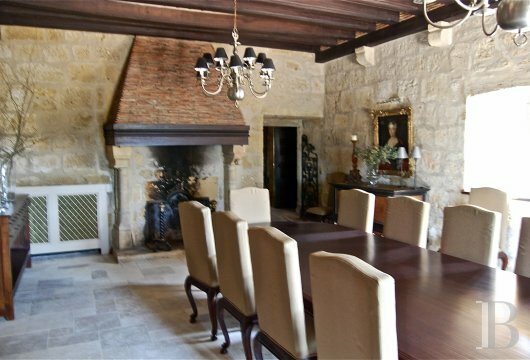 The left-hand side, the lowest part, has an intimate taverna with wood oven (31m²) and a billiard room (39m²), both of which set a leisurely tone to the abode. 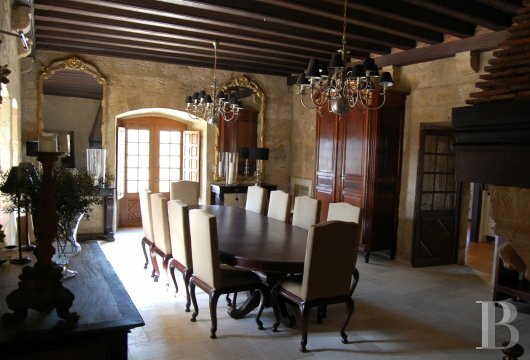 To the right, the highest part of the château houses the reception rooms: lounges and dining room, as well as kitchen. 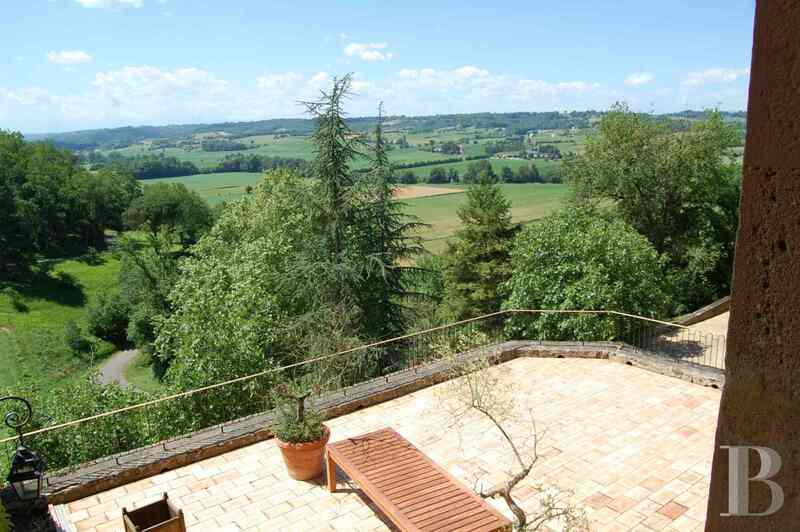 The latter is spacious (23m²), bright, airy, with all fittings and a hexagonal tiled tomette floor. 18m² pantry. Very practical laundry room (14m²). 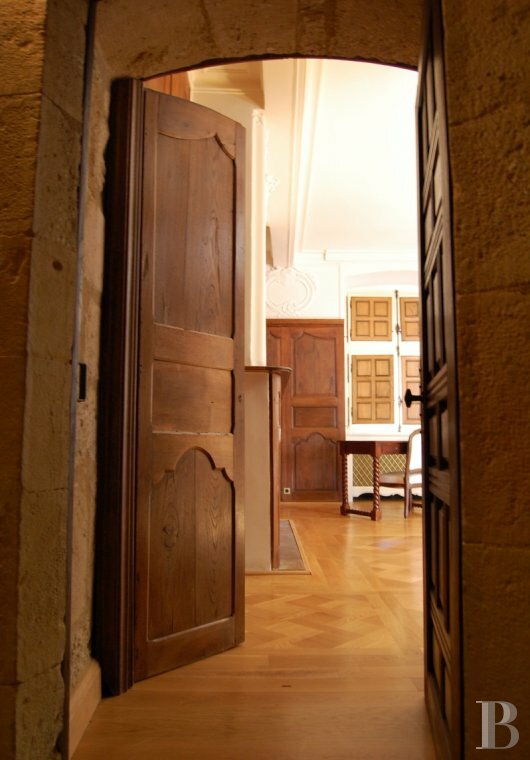 Wine cellar (13m²). 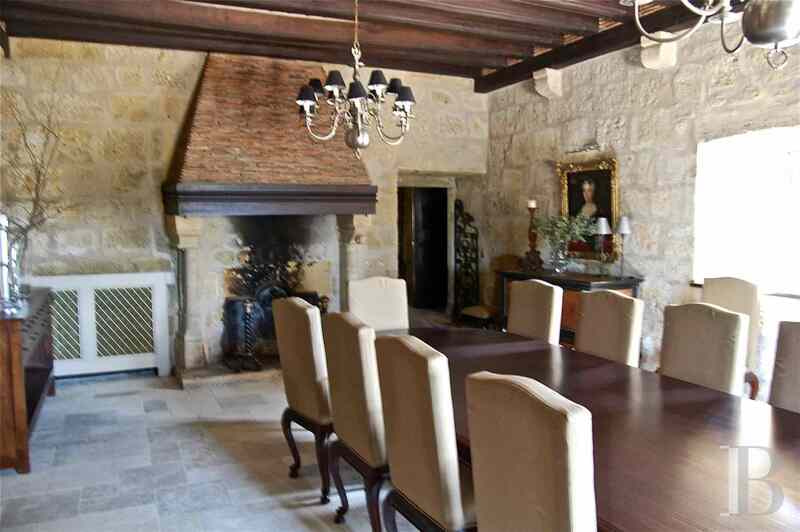 The 50m² lounge and 40m² dining room each have fireplaces, one with a stone surround and the other with a brick overmantel. Pyreneen flagstone flooring. Freestone walls. Similar passageway as the ground floor. Bedroom (47m²) and bathroom (14m²) above the taverna and billiard room. 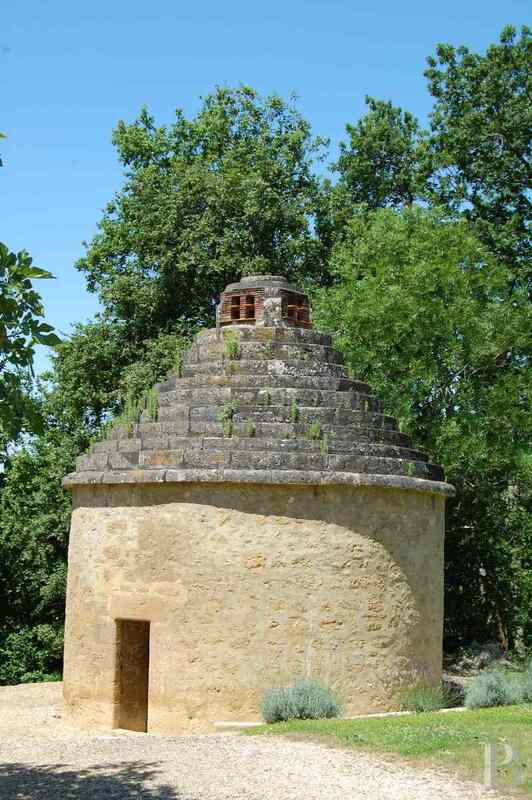 To the right, a spiral staircase in the hexagonal tower leads to two bedrooms: the first (35m² with a 3.39m-high ceiling) has an ensuite bathroom and separate toilet behind a walnut partition. 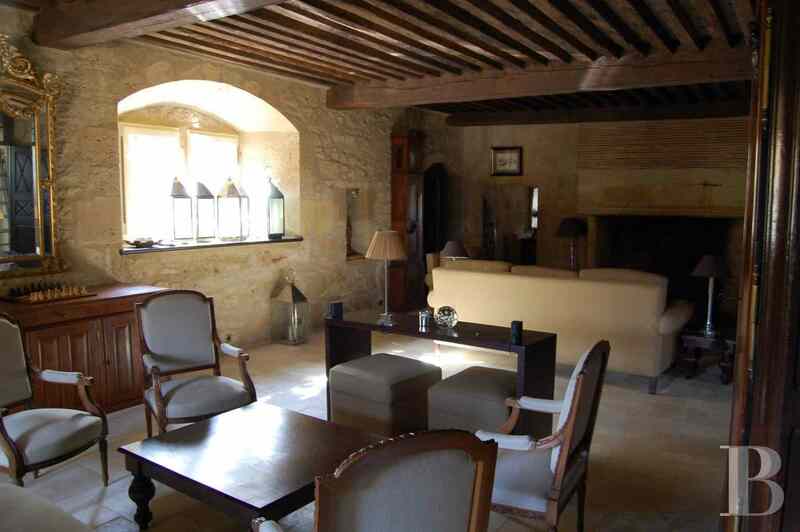 The second one (38m², 3.15m-high ceiling) has an ensuite bathroom with marble floor (4m²). 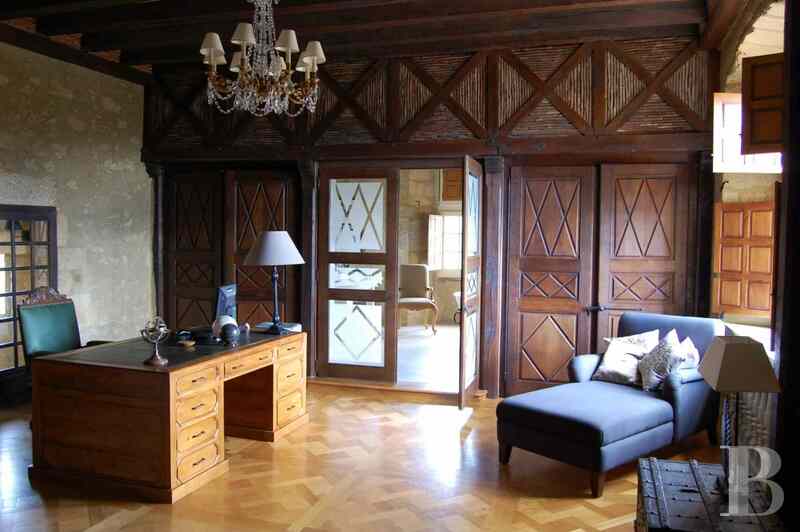 The bedrooms both have oak parquet. Pretty 18th-century walnut panels and stucco. The upper levels span the right-hand part of the building only. 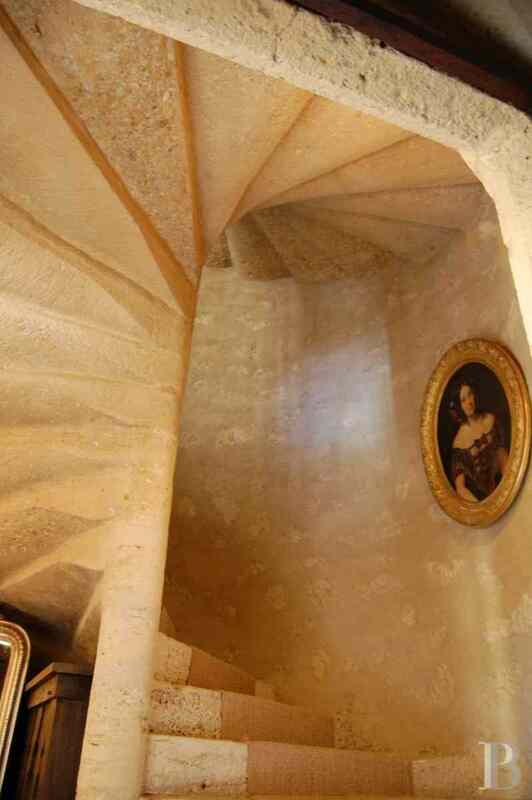 The two main rooms are accessed via the spiral staircase. 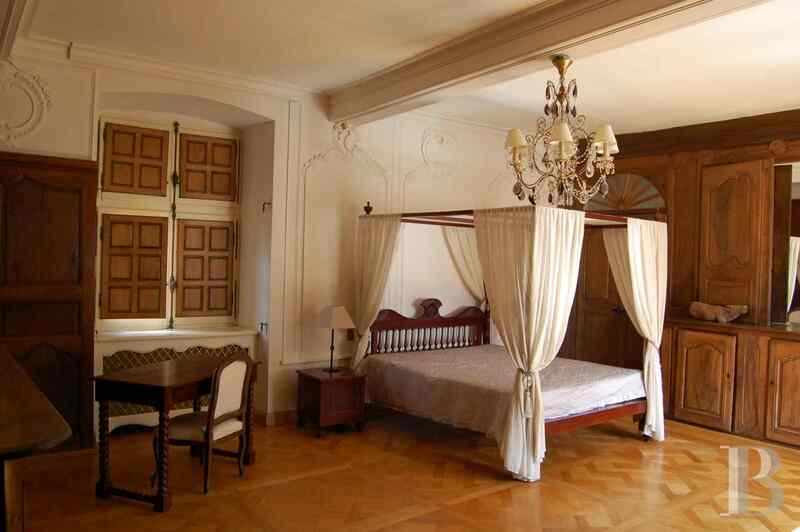 The first is a master bedroom (44m², ceiling height 3.41m). The second is used as a study (41m², ceiling height 3.52m). It has an ensuite bathroom (27m², ceiling height 3.46m) with separate shower and marble flooring. 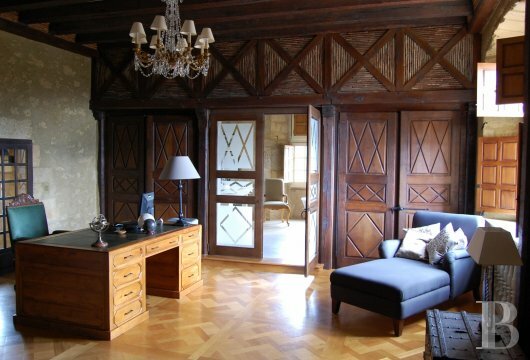 The master bedroom has an oak parquet floor, a Renaissance-style stone fireplace with a brick hearth. The toilet takes pride of place in the pepperpot bartizan. 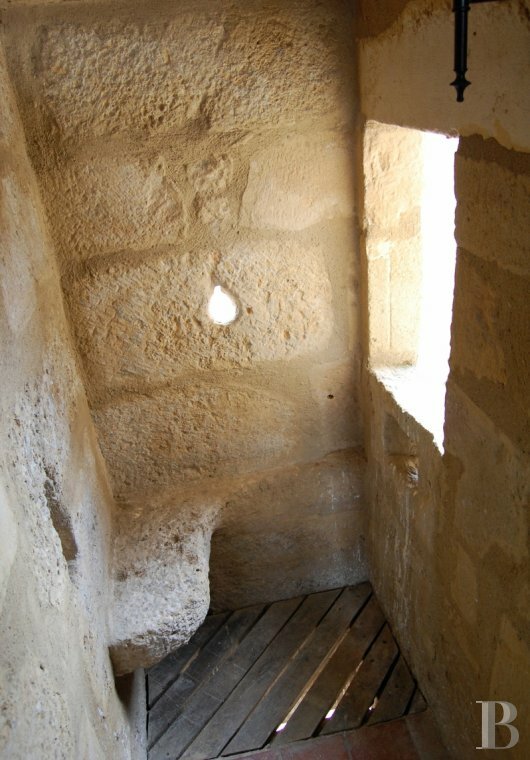 The second bedroom, currently an office leads on to a bathroom which has a suspended balcony with that faces north-east. The loft has been converted into two main rooms, served by the same spiral staircase as the floors below. The eaves are different on each side. On one side the intricate work resembles a crib. The bedroom which has this feature (23m², ceiling height 2m) has a bathroom (7m², ceiling height 3.46m) The second bedroom is bigger (37m², ceiling height 2.45m) with dormer windows. 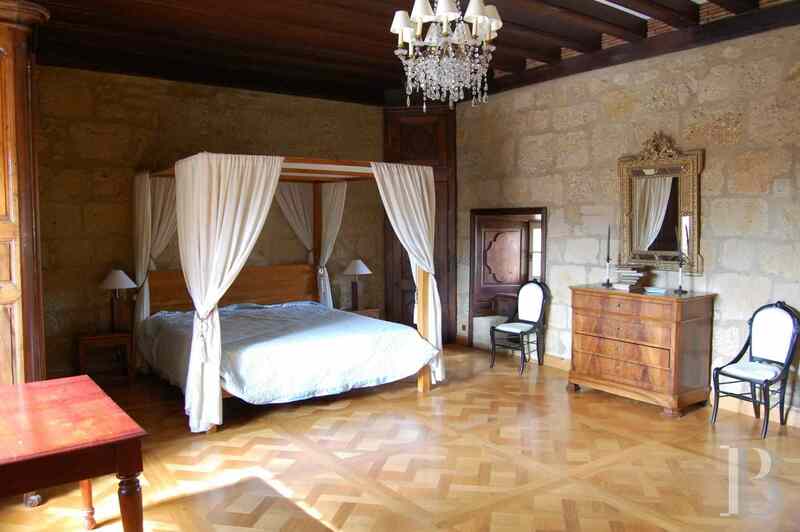 Both bedrooms have oak floors. The ground floor comprises a large room currently in use as a kitchen and dining room (29 m², ceiling 3.11 m high) as well as a lounge (22 m², ceiling 3.30 m high). The floor is covered with wide, square bricks. 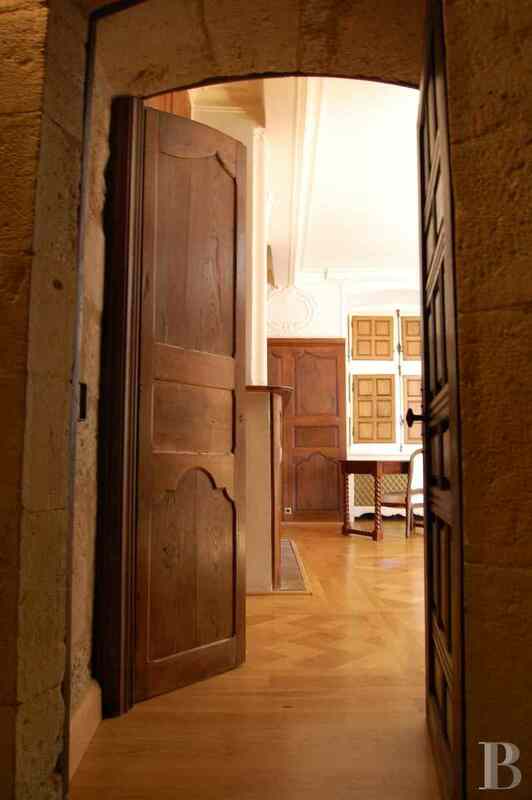 Upstairs, a corridor provides access to three bedrooms (15 m², 8 m² and 13 m²) as well as a bathroom (13 m²) with travertine floor tiles. The ceilings here are 2.90 m high. This residence features an architectural authenticity which is reflected in the layout of the kitchen-dining room, where residents traditionally spent most of their time as it was the only room to be heated during the winter. These premises, made cosy by their size and illumination, exude simplicity. This level has been comfortably converted. 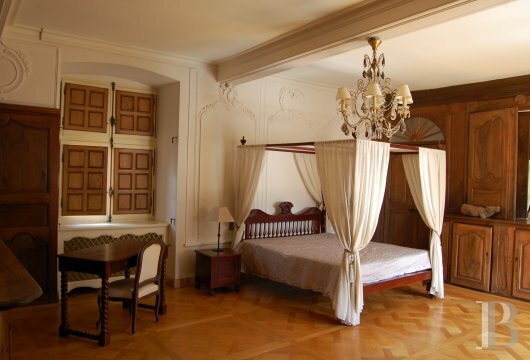 Although modest in size, the bedrooms are pleasantly laid out. The floors in the corridor and the bedrooms are covered with sea-rush matting. The bathroom has travertine floor tiles. 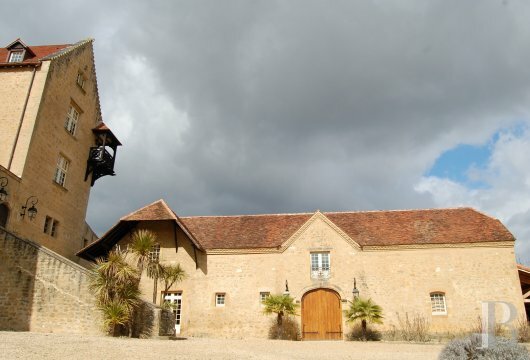 The old stables, converted into a winery for a while, could easily be used for their original vocation once again or be converted into a function room. The current building spans two levels. In addition to the stables on the ground floor, the upstairs office looks down on the lower section. The former stables span a floor surface area of 107 m². The section under the office has a 3.21 m high ceiling whilst the ridge goes up to a height of 8.24 m. A workshop area, with a shower and toilet, spans a floor surface area of 21 m². 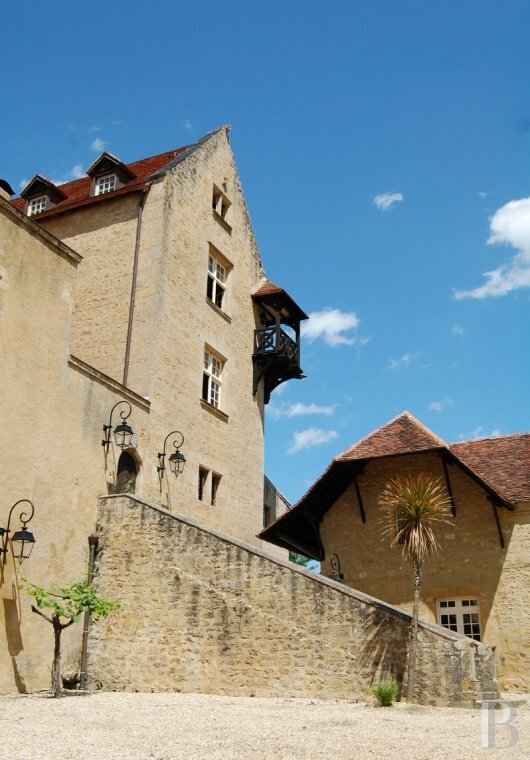 The ceiling beams in the office (58 m²) are 1.95 m high whilst the ridge goes up to a height of 4.94 m.
The chateau is a local treasure, but over and above its site and its historical pedigree, visitors are struck by its allure, the splendour of its stonework and its excellent state of repair. 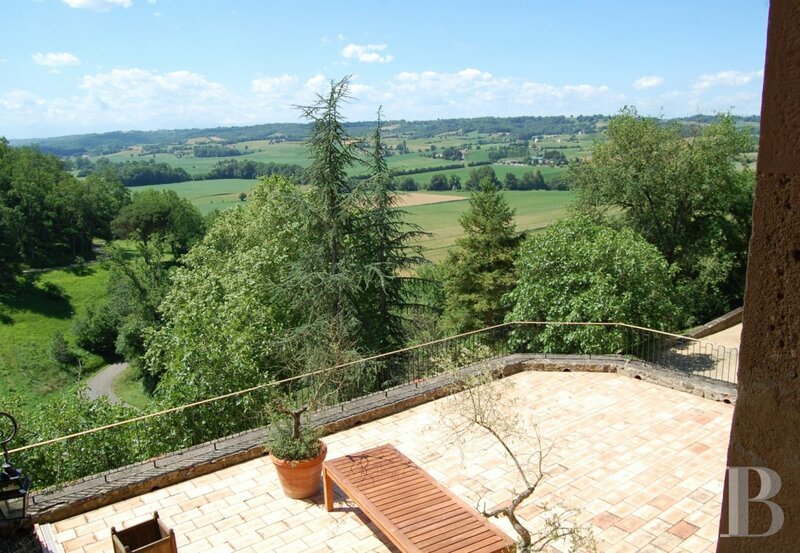 The high-quality renovation works and the conversions carried out make this not only a superb home, with every comfort, but also a sound investment. The occasional rental of the chateau represents an investment in itself as it covers the cost of upkeep and staff salaries. This property, a place of residence and/or commercial business, is a good example of total privacy and has the benefit of a particularly good geographical location.